The pic above is from my handmade book, “Mother as Writer”. This is how it looks after adding colour to it, freehand in an art app, and then placing it in a page, in the “Book Creator” app, and typing in the words, which replace the pen written words of the original page. Though I also still like the look of my original handwriting. I was so excited when I found the “Book Creator” app and also “Scanner Pro”. This meant I could easily scan in my pages from my handmade books and turn them into ebooks; with the option of also creating a hard copy book from this app. There’s more about these areas, on my page, “Some App Information”. I made the slideshow below; with some pages from my handmade book “Mother as Writer”. I wanted to give you an idea of how easy it is to get your words and pictures onto pages in a book, in “Book Creator”. This book is a long narrative poem, which turned into an illustrated book; which often happens to my poems. At the least, my poems are dressed up with a drawing – they help each other out…a sort of a synergy. I wrote the “Mother as Writer” poem very quickly. I was in the middle of, I think, cleaning one of boy’s bedrooms, who were still quite young then. I remember, thinking about how on earth was I ever going to get time to do any of my arty projects. I’d just read about a woman, who was a writer and spoke about walks on the beach, and having coffees as she pondered her next piece of writing. That was just soooo – far removed from my own writing life; it kind of triggered a response poem! I thought, well – this is how I write and off I went. I dashed down some lines: did some more cleaning, dashed down more sentences, kept on working, scribbled down more lines and so on – this being the usual way that I had to write (and draw). 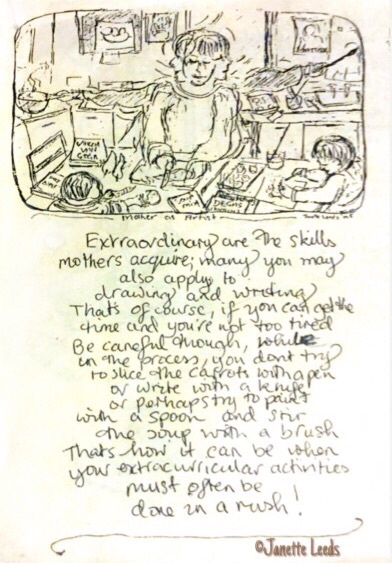 Part of the back cover of my “Mother as Writer” book; (paper isn’t this yellow) could well have been titled”…as Artist”.. It flowed surprisingly well from the very first draft; which is not often the case. As I reread it, I was encouraged to see, that for a busy mother (is there any other!) I didn’t do too badly. I did actually get some writing and drawing done. So I polished it up (redrafting is always so neccessary); drew the illustrations, photocopied, stapled it up and sold the books locally. I wanted my book to encourage other mums – and myself! – that arty or other projects; can get done, between housework and bringing up a family. It just takes time (a lot longer than usual), and perseverance – one of my favourite words. For me, it was certainly worth weaving my art and words throughout my day, in this way; as I loved being at home with the kids – always inspirational. My art and words are very much about my life. The feedback from people (glad it sold well), suggested it was an encouraging read. I still work around family life (I’m sure many of you do too), but have a little more time to work on my many projects. Hope to get this one available to a wider audience very soon. I’m greatly inspired by your blog. I would like to print some of my iPad works, blowing them up, but I fear the quality is too low, dpi wise, not that I know much technically. Do you have suggestions. I love your work. It has a freedom and good flow. With the art apps I use I get excellent print quality in A4 (29.7cm x 21cm,11.7in x 8.3in) and most print very well in A3 (29.7cm x 42.0cm, 11.69in x 16.53in) with negligible pixelation. I use a great app called “Big Photo”, to resize my iPad art to about 12megapixels before I upload them to RedBubble. This enables larger prints. There’s a bit more information about these areas on my page “About Some Art apps, Other apps and My Books”. Happy printing. Thanks! This is a bit technical for me, but I will study, and also pass it along to my husband. He understands these things much better. Yesterday he ordered one of those canvases with a picture of my art on it. He had to upgrade the quality somehow. It’s for a birthday present, so I hope it turns out well. Wow, that’s really cool – thanks for the recommendation! I’m looking forward to playing with that!